While not wishing hardship on any opera company, forced economy can sometimes reap greater artistic dividends than the generosity of unlimited funds. I find it hard to believe that David Pountney’s decision to base his new production of Debussy’s Pelléas et Mélisande in the same (expensive-looking) set by the late Johan Engels that had embraced their acclaimed staging of Berg’s Lulu two seasons ago was purely an artistic one. But what ever the savings of ‘make do and mend’, there’s validity in the director’s drawing of parallels between the two operas and in particular their leading ladies. 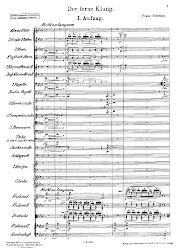 Both Lulu and Mélisande seem to have an uncontrollable effect on all the men they meet, but with the difference lying in their self-knowledge: Debussy’s heroine is no femme fatale, but an innocent in a cruel world. Pountney emphasises this, not only in the depiction of her victimhood at the hands of Golaud, but also suggesting that there isn’t a man in Allemonde who can elude her charms – from the aged Arkel even down to the ‘petit’ Yniold, who here enacts his Act IV scene with the boulder and shepherd as a game with Mélisande (and where, in another tiny money-saving solution that brings interpretative insight, it is left to the prowling Golaud to utter the off-stage Shepherd’s single line explaining darkly why the sheep have gone silent – a more ominous portent). Otherwise, the Lulu connection is lightly played, with lurking wild animal figures framing the action (Lulu after all begins with the Animal Trainer and his menagerie, Pelléas with Golaud out hunting an unspecified ‘beast’), leaving us to make our own connections – and what an admirably ‘grown-up’ way of a company embracing the loyalty and trust of its audience through different seasons. 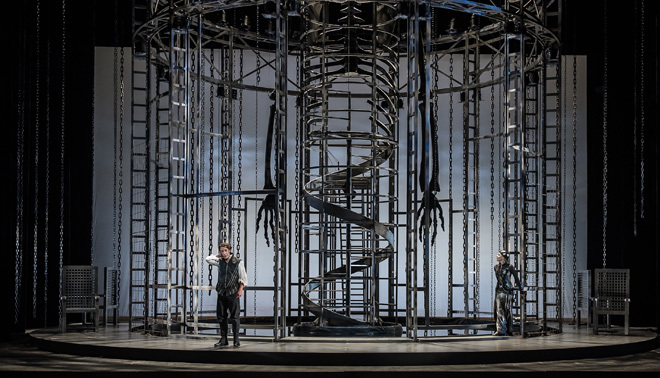 The cage-like nature of Engels’s set proves apt as a metaphor of Allemonde’s stifling sense of imprisonment, with the back of the stage opening and closing on images of stars and sunsets – the inaccessible world beyond the characters’ confines. Marie-Jeanne Lecca’s magnificent costumes lend an air of Pre-Raphaelite-meets-Belgian-art-nouveau decadence to the otherwise spare and grim setting. 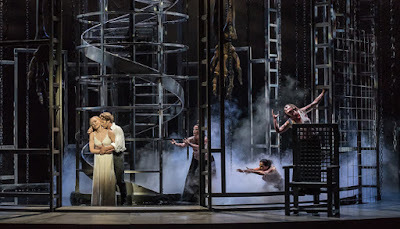 Pountney’s direction of the characters is as perceptive and illuminating as ever, with some elements that seem to cut across the specifics of the libretto – the Rapunzel-like tower scene, for example, where the physical separation of the lovers suggests more a dream on Pelléas’s part than real interaction; and others that interpret the text in new ways: at the very end, the director takes’s Arkel’s words ‘she’s gone without a word’ literally, after Mélisande has got up from her deathbed, wound herself in funeral shrouds and silently left the stage with the servants. This is one of the most intensely moving scenes in all opera and was made even more so in this staging, helped by the equally beautiful and controlled playing of the WNO orchestra, here as much as through the work as a whole. Indeed, Lothar Koenigs’s partnership with his musicians drew playing that was as translucent as it was sheerly beautiful, with a sense of pacing that made the emotional climaxes all the more intense in their effect. 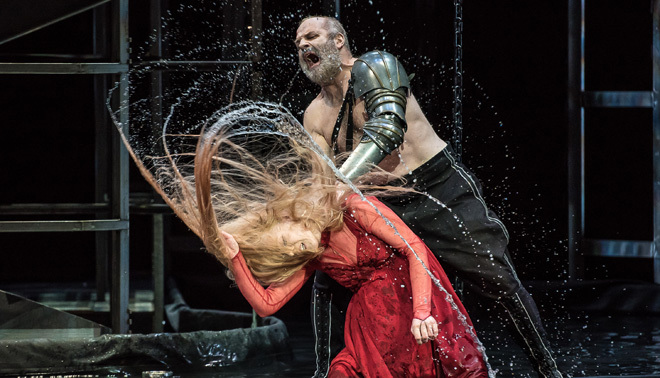 The opera might as well have been entitled ‘Golaud’, such was Christopher Purves’s command of every scene in which he appeared – as ‘hunter’, jealous husband, callous half-brother or remorseful widower: one of this superlative singer-actor’s most compelling roles to date. As such it put Jacques Imbrailo’s youthful and vocally ardent Pelléas a little in the shade: he was deliberately portrayed as the cowed younger brother whose shyness and insecurity are overcome by the allure of Mélisande. And the Lithuanian mezzo Jurgita Adomonytė inhabited her role in full, conveying an air of mystery at the same time as a kind of almost knowing innocence as her character comes to recognise her power. Hers is a rich but subtle vocal instrument, nowhere more compelling than in her almost whispered ‘Je t’aime aussi’, and she carried Debussy’s parlando lines with lyrical ease. Scott Wilde was a wonderfully sonorous Arkel, Leah-Marian Jones a sympathetic Geneviève, Rebecca Bottone a convincingly virile Yniold and Stephen Wells (bewigged and bearded as if Debussy himself) more than a mere cameo as the Doctor. If I had paid more attention to my French at school, the surtitles would have been superfluous, so clear was the diction all the singers.